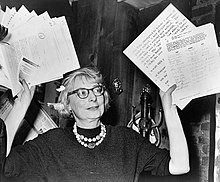 Jane Jacobs (May 4, 1916 – April 25, 2006) was an American-born Canadian urbanist, writer and activist, most famous as author of The Death and Life of Great American Cities (1961), a powerful critique of the urban renewal policies of the 1950s in the United States. In 1968, Jacobs moved to Toronto, where she lived until her death. I would spend a nickel on the subway and go arbitrarily to some other stop and look around there. So I was roaming the city in the afternoons and applying for jobs in the morning. And one day I found myself in a neighborhood I just liked so much…it was one of those times I had put a nickel in and just invested something. And where did I get out? I just liked the sound of the name: Christopher Street — so I got out at Christopher Street, and I was enchanted with this neighborhood, and walked around it all afternoon and then I rushed back to Brooklyn. And I said, "Betty I found out where we have to live." I did have an inkling that I was going to be a writer. That was my intention. Extremists typically want to squash not only those who disagree with them diametrically, but those who disagree with them at all. I was brought up to believe that there is no virtue in conforming meekly to the dominant opinion of the moment. I was encouraged to believe that simple conformity results in stagnation for a society, and that American progress has been largely owing to the opportunity for experimentation, the leeway given initiative, and to a gusto and a freedom for chewing over odd ideas. I was taught that the American's right to be a free individual, not at the mercy of the state, was hard-won and that its price was eternal vigilance, that I too would have to be vigilant. I was made to feel that it would be a disgrace to me, as an individual, if I should not value or should give up rights that were dearly bought. I am grateful for that upbringing. We must demonstrate that it is possible to overcome poverty, misery and decay by democratic means, and we must ourselves believe, and must show others, that our American tradition of the dignity and liberty of the individual is not a luxury for easy times but is the basic source of the strength and security of a successful society. The other threat to the security of our tradition, I believe, lies at home. It is the current fear of radical ideas and of people who propound them. I do not agree with the extremists of either the left or the right, but I think they should be allowed to speak and to publish, both because they themselves have, and ought to have, rights, and once their rights are gone, the rights of the rest of us are hardly safe. Extremists typically want to squash not only those who disagree with them diametrically, but those who disagree with them at all. It seems to me that in every country where extremists of the left have gotten sufficiently in the saddle to squash the extremists of the right, they have ridden on to squash the center or terrorize it also. And the same goes for extremists of the right. I do not want that to happen in our country. As for really new ideas of any kind—no matter how ultimately profitable or otherwise successful some of them might prove to be—there is no leeway for such chancy trial, error and experimentation in the high-overhead economy of new construction. Old ideas can sometimes use new buildings. New ideas must use old buildings. Subsidiarity is the principle that government works best — most responsibly and responsively — when it is closest to the people it serves and the needs it addresses. Beneficent spirals, operating by benign feedback, mean that everything needful is not required at once: each individual improvement is beneficial for the whole. The subject itself is gloomy. A Dark Age is a culture's dead end. We in North America and Western Europe, enjoying the many benefits of the culture conventionally known as the West, customarily think of a Dark Age as happening once, long ago, following the collapse of the Western Roman Empire. But in North America we live in a graveyard of lost aboriginal cultures, many of which were decisively finished off by mass amnesia in which even the memory of what was lost was also lost. Throughout the world Dark Ages have scrawled finis to successions of cultures receding far into the past. The salient mystery of Dark Ages sets the stage for mass amnesia. People living in vigorous cultures typically treasure those cultures and resist any threat to them. How and why can a people so totally discard a formerly vital culture that it becomes vitally lost? Subsidiarity is the principle that government works best — most responsibly and responsively — when it is closest to the people it serves and the needs it addresses. Fiscal accountability is the principle that institutions collecting and disbursing taxes work most responsibly when they are transparent to those providing the money. Privately run jails are a mark of American "reinvented government" that has been picked up by neoconservatives in Canada. Jacobs has never been political in the sense of supporting one ideology or party over another. Larger ideologies, she firmly believed then and continues to believe, only obscure the realities, which are to be found by looking around, paying attention, and trusting your eyes over what people are merely saying. In that spirit, she always supported the right of labor unions and grass roots movements to exist. 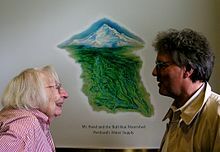 "I think it is good for us to have vociferous political minorities and to know how to live with them," she wrote. But her personal support of any individual cause was always based on her absolutely unbending principles. This page was last edited on 17 January 2019, at 20:28.